Residual revenue streams are the goal of every business owner. By setting up systems to work on auto-pilot, they can then earn greater income without putting in too much extra work. Boot Camp Marketing Expert Sam Bakhtiar, CEO of Fitness Concepts, shares 5 of his top revenue streams here and online at http://www.Super-Trainer.com, where he mentors fellow fitness business professionals. Residual revenue streams are enabling fitness business professionals to earn greater income, with minimal effort. These programs and systems are set up with minimal cost and effort, but are fantastic ways to raise revenue for expanding an enterprise. Sam Bakhtiar, CEO of the Fitness Concepts boot camps in Chino Hills and boot camp marketing expert, says it wasn’t until he discovered passive income streams that he was able to break the six-figure barrier doing what he loved. 1. Different Boot Camp Levels – Structuring a program into “Beginner,” “Intermediate” and “Advanced” levels is an easy adjustment to make. 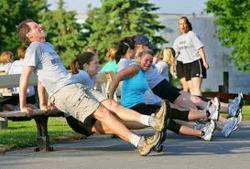 It’s not only a way to make boot campers feel more comfortable – but also an easy up-sell, as people logically follow through the different levels to achieve greater fitness skills. 2. Related Products – Creating a contest called “The 8 Week Total Body Burn” is a great way to sell boot camp classes on the back end. One can also sell boot campers on the idea of an exciting contest as well. It’s just that easy! 3. Affiliate Products – The fitness industry lends itself to all sorts of cross-promotional opportunities that add value to a boot camp. For example, there are nutritional / exercise books, vitamin supplements, whey protein, workout clothing brands, exercise equipment, and more. 4. Referral Programs – Discounts for the referrer and the friend provides instant gratification and boosts the value of a boot camp. People who refer friends are more likely to continue coming to the boot camp for years to come. Also, referral programs are some of the cheapest and easiest promotions to run. 5. Loyalty Programs – A loyalty program gives customers points every time they purchase something, whether it’s a product or a bootcamp. When they reach a certain number of points, they can get products for free. That keeps existing clients happy and inspires many people to sing like a canary about how great the boot camp is. Free advertising rules! For more boot camp marketing advice, trainers and business owners may visit Sam’s blog at http://www.Super-Trainer.com.